Four simple little words. Four words that may seem simple, and a question that is anything but. Four words that, if you really stop to contemplate them, can change your life. I have a concern about many of my fellow Christian brothers and sisters and their use of the word “worship.” It has become a Christianese alternative to the word music. Instead of bands, we have worship teams. Instead of singing, we have “gettin’ my worship on.” Now, I have no problem with using music for the worship of God, but if we only use the word worship in relation to music. While I understand that language evolves and changes to suit those who speak it, the path we are on can be rather dangerous. There is a long history of using music for worship, but worship encompasses so much more. We are called to worship God in every aspect of our lives. There is no “worship box” that we get to jump into and party every once in a while. We need to realize that we should never get out of our worship box. This might sound hard, but it becomes very simple after a little contemplation. We live in a world where many of us define ourselves by our work. One of the first questions that we ask after meeting someone new is usually, “So, what do you do for a living?” It isn’t a bad question, but it is indicative of how obsessed we are with our jobs. We also have a tendency to keep our jobs and our faith separate. Sometimes this is because we are discouraged from talking about faith at work, and sometimes it’s because we are afraid to be laughed at for our beliefs. So, how do we worship as we work? We need to work like God is really in charge. If we really believe that God is boss of our lives, we need to live that out at work. Integrity (like not stealing from work, either work supplies or time, working hard, helping out) should be paramount as you conduct yourself at work. As a representative of your faith, people are watching how you do life. If you are no different from those around you, what does that say about the power of your God? If we consistently go above and beyond what we are asked to do, people may take notice and wonder why. In addition, God has gifted and called us to do certain things. This may be creating art, or it may be running a business, or it may be sweeping floors at a local diner. In each of these situations, God can be glorified and worshipped if we put everything we have into our work. Brother Lawrence, a 17th Century monk, worshipped God by washing the dishes and serving in the kitchen of the abbey. His book, The Practice of the Presence of God is still widely read for its usefulness in finding God in our day-to-day life. I love movies. I love stories, and movies are one of our greatest forms of storytelling in the West. I get great enjoyment out of watching good conquer evil and the boy getting the girl. But I’ve had to start asking myself: “Does watching this film bring glory to God?” If I can draw something out of the story to use (either on this blog or in writing my own stuff), then I can say that it does glorify God. Yet, there have been times where movies that I would otherwise like to see have very little content that I felt would bring me closer to God. In these cases, I’ve realized my time would be better spent elsewhere. Like I said above, to many people we come across, we are ambassadors for our faith. This can be great when we are able to talk about what we believe and why. It can also be awful when we realize we just blew up in anger, solidifying common stereotypes about religious people. If we are really called to love one another, perhaps that should be a common theme throughout our day. This isn’t easy. Not by a long shot. There are times I don’t feel particularly loving to people, but my worship to God is in treating them lovingly anyways. We often think of love as an emotion, but the heart of love is sacrifice. Love is easy when we care deeply about someone. Loving someone who just gave us the finger as we drove to work is much harder. Yet, this is where worship lies. Finally, our relationship with God is our overarching act of worship. We draw nearer to our Creator to worship Him. We grow in our love and trust in Him to worship Him. We study and learn about His ways to worship Him. This relationship is the foundation upon which we build the rest of our worship. This can be nurtured in many ways. Quiet time in meditation, reading Scripture, going to church. Whenever we take time to reconnect with our God, we are saying to Him, “I love You and want to worship You.” He will answer by showing you how best to worship Him in your life. Which is vital to remember: everyone’s worship is going to look different. Mother Teresa worshipped by serving the poorest of the poor. A corporate executive can worship by ensuring his or her company is run ethically. The artist can worship by being loyal to the calling that envelopes his or her life. We can help each other find and refine our worship, but we shouldn’t jump to judgement just because someone else is doing something different from your worship. There is much more to say about worship, but I will save it for future posts. I hope you all have time this week to think about your worship, and how all-consuming it should be. So, how do you worship? Love this and completely agree (obviously). Something else I thought of…when you’re saying one of our first questions to strangers is, “What do you do for a living?” I now wonder if it’s not ONLY because our jobs have become our life…but I think we’re also socially awkward. We’re so busy playing on our phones, tablets, computers, anything technological. I feel like we don’t know how to talk to each other anymore (even though a phone is “technical” – forget it..it’s becoming one of the top fears among North Americans! What?!). So I wonder if people don’t know how to act around each other – so we default to the classic, “What do you do for a living?” I’ve been trying to figure out how I can glorify God in those moments (with Facebook, or email…how can I be different?). That’s a sidenote of course. But this was great! I completely agree that worship is what we do with every part of our bodies and lives. Thanks for joining the conversation! Love this post, as I have been trying to find new ways to worship God at home in seemingly mundane tasks that can be used instead to bring glory to an amazing God and shine a light to others. It all matters! A small thought: The reason I feel uncomfortable calling the band “a band” when they are on stage leading worship is because for some reason, a group of musicians called “a band” (and even worse when church bands have names!!) 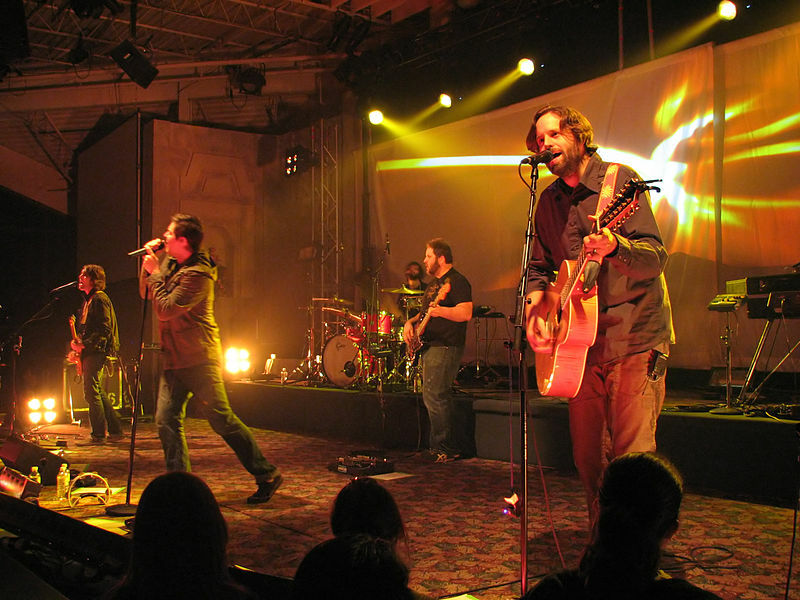 makes we want to admire their talents…..dare I say my worship moves from God-centric to band-member-centric. My adoration of the vast talents on stage changes my mind set to the wrong place. Now to be clear, I am not advocating for less music or less band or even less visible distractions. As a former worship band/team member, I had to be sure my mindset was in the right place. Am I playing this worship song to show off my super insane shredding bass guitar talents or to glorify God? There is a fine line between playing for show and play to glorify God. Great insight as per usual! Thanks Jared! Your comment is very thought-provoking. We have been discussing how to walk the fine line between performance and worship-leading, and what that line is in the first place. I’m not sure of the answer right now, but I hope with time, contemplation, and practice, God will lead all of us to a proper place. As always, thanks for chiming in! I miss our talks.